It's been a five month long road/plane/train-trip from Cape Town to Sydney for the Star Trek CCG 2nd Edition World Championships. Along the way, I did the German Nationals in Kassel and European Championships in Munich. Like any modern trilogy, the third part is itself split into three parts! Here, I give you the buildup to my Australian trekabout, following immediately after day 1 of the European championships. ... if that seems overdramatic, it's just a salute to an article written by The Brad Defruiter 17 years ago where he discusses his preparation for the 1998 world championship. I always wanted to do the same, writing this article is a big bucket list item checked off. Stefan Slaby had modified his already-world-beating Voyager to go 5 space. He liked that he didn't have to face Greater Needs and going all space puts strain on the opponent's dilemma pile in general. 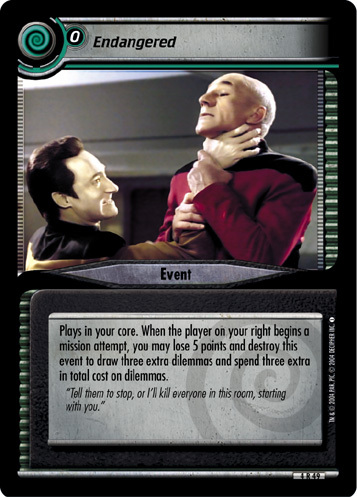 He didn't play the new Chakotay because of the extra cost, and a big deck can deliver enough events to fuel Chakotay, Bridge Between Two Crews. Speaking of events, not using Security Drills was a mistake. Finally, his first mission solve was Orlitus Cluster where 1-cost personnel are cunning 7. If you have Thirst For Knowledge out after your first solve, they become cunning 8 Artificial Ability fodder at Orlitus Cluster, which is bad. From Oleg Rhyzikov the insight that you most often don't get to move to a new mission after solving the previous, making Field Studies a dead card on the next turn's play and draw phase. He also impressed me by cheating skills with Cluttering Irrelevancies on the holograms. Will Banned and Nick Yankovek convinced me that if I was going to play something complicated, a kill pile can actually be simple if you just name mission skills for All Consuming Evil and The Clown: Guillotine. Once the opponent's personnel are dead their turns become shorter, which also helps with the modified win situation. Johannes Klarhauser had an experimental build with 1-costers, Lore, and Tabor. If they hit a wall, Lore and Tabor wouldn't be stopped, and the 1-cost guys would be unstopped by Janeway. I tried Johannes' idea first. 3 copies of Lore and Tabor went in, and it seemed reasonable in Lackey. Of course Munich taught me that the difference between me practicing against myself and real people is that real people read the cards, so it was time for online games. In an online tournament I got my first win against Michael van Breemen, which was encouraging, but he wasn't playing a serious deck. Moreover, a serious problem was revealed: when people see Lore, they can hit you with a wall followed by Where No One Has Gone Before. Tabor required a bit of effort to set up the discard pile, and both Lore and (especially) Tabor were big Secret Identity targets. I considered packing Krim to make the obvious SI pick blow up in my opponent's face, but then what if I drew him? I persisted for a while but ultimately didn't find it much stronger than before. It's possible that this build is still out there, lurking in the shadows. At Euros, I didn't consistently have a commander for RATS, counting draw/spend with Vic was a pain and he was a dead weight Cunning 4 at most of my missions, so I took the dilemma choke theme out completely. Taking out Field Studies lead to a big breakthrough: I now had points to use on dilemma support. Endangered is another event to play on your first turn (non-HQ decks need something to play if you don't draw your ship). It's also great for Chakotay unstopping cheese and the 8 cost dilemmas, which fit nicely into my new kill pile. Conflict is essentially the same thing in Interrupt form, so it can be pitched for extra kills with A Taste of Armageddon and Simulated Prey. The extra draw/spend on dilemmas kept the kill pile relevant after the first attempt where you slaughter their crew but put 5+ under. Against a kill pile good players keep their mission skills back, let everyone else die and then attempt with the perfect four or five people who are usually not capable of solving against another 6 counters. I tested again in lackey and found that my slightly slower than all out solver pace (I could win in 9 turns against attrition played with perfect knowledge) was now pretty good compared to anything that had to deal with a kill pile. Against Alexey Korolev online I lost 80-100 against his DS9 with Ezri and the Sao Paulo. Factoring in some bad mistakes, that was pretty good for a really bad matchup. When he switched to his own Voyager we went 1-1 (in fact my first win against him) and we discovered that Voyager is also decent against a kill pile. No worries about destaffing, no HQ for Final Adventure, and a decent amount of kill prevention in Revised Chakotay and Telfer fetching Escape. Good attributes with Thirst for Knowledge means you can rebuild to a small number of people and still solve. In mid-August, I was contemplating my imminent departure from Europe and how much practice I would be able to get before worlds. I had signed up for online tournaments, but they might involve people who were also going and I didn't want to advertise my deck. My eye came across a Lower Decks “release” tournament on the 22nd, hosted by Tjark Ott in Koblenz. On the pre-registered list were some friends from Kassel. Sascha, Benjamin and Johannes M were driving to Koblenz (about 2 hours away) and between us we organised that I would take a bus to Kassel, we'd drive to Tjark’s place together and then they’d host me at a second tournament in Kassel the next day. Trek road trip time! 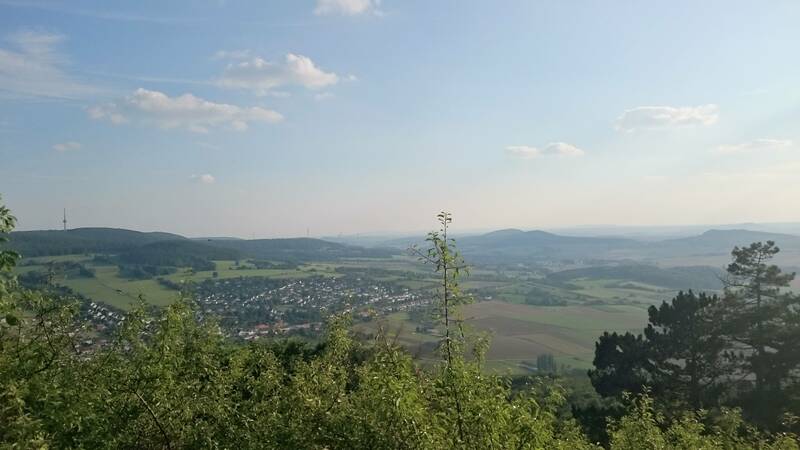 When I got to Kassel, it was all nerd training montage. Hiking up a mountain with heavy boxes of cards on my back. Getting crushed in the Voyager mirror match by Sascha. Four hour energy-drink fuelled drive to and from Koblenz. Lower Decks free-for-all between 8 tough competitors. Gruelling game to time against Thomas Schneider. Beaten down by Benjamin's Klingon battle, getting back to my feet in a daze, then a Tragic Turn retaliation to hold on to a 5 point win. Another Voyager mirror smackdown from Sascha. Burger King. The next day: again. Racing against sleek Starfleet, Relativity and Klingon solvers. Put to the screws by Cardassians, examined by Romulan Far Seeing Eyes, blown up by Dominion. Placing twenty dilemmas under three different missions before I could solve anything in a No Win Situation. Then, at the end of a weekend of 15 games of trek, a victory against 5-space Sensei Sascha. I had passed the final test. That weekend was a serious confidence boost in my deck’s ability to compete in a Worlds Day 1 tournament. There were some hassles with consistency of the pile, with too many non-kill to kill dilemmas, and a bit of hand clog from too many interrupts but otherwise I had survived (beaten, even if narrowly) a wide range of decks played by good players. I had also learned that against most interference I could just keep going and win, and that in the mirror match the kill pile makes Homeward Bound useless: there's no point unstopping zero people. I now knew that I wasn’t playing The Wrong Deck, in fact 5-space Voyager felt like the deck to beat. I just had to keep it under the radar, because I didn’t want to face masses of kill prevention or have everyone include 3 copies of Distress Call like Johannes M did to win the Lower Decks release. Time to go conspicuously practice with something else, and preferably lose. In fact, Project Underdog was already underway. In the August TK "Invitational” I was 0-2 after two 100-0 losses with a Neil Timmons TOS battle deck. I decided on the deck because Jon Carter had used it to obliterate my Bajorans a year earlier, and at the time it seemed crazy good. Also, I would have no headquarters to repair my ships at worlds. The plan was to play it and learn from how the other guys played against it. Turns out the reason people don’t play battle very often is that it’s quite hard to pull off. I ended 2-2 after it worked perfectly once, and then reached the point against Elveez's Starfleet where I had to give up on battle and go all-out solving to squeak through. 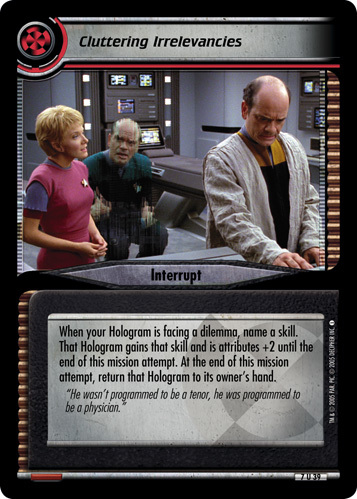 Mostly I learned not to fear the deck, because most people wouldn't bother, and I had B'Elanna, Straightforward Engineer and The Doctor, Emergency Command Hologram who would help out. There was also Kris Sonsteby's Summerslam PPV where I tried out Steve Hartman's Gamma Quadrant Cardassians. He topped day 1 of Australian continentals and I had lost to something similar (perhaps a bit bigger) played by Jens Bielstein at German Nationals, but my Voyager hadn't faced it yet. I wasn't about to bring the real deal out just before worlds (and the element of surprise did help a bit later on) so the alternative was to play it. I didn't make a glorious showing at 1-2, but I saw enough of the GQ Cardies to believe that that they weren't above curve compared to other solvers. Mission accomplished. Then it was the calm before the storm. I read up on a few decks I thought I might see, but otherwise packed the cards away and enjoyed a bit of tourism in Dublin before my flight to Oz. I was ready. In the next part, Fritz discusses the week before the 2e World Championships, including an end to a 12-year retirement from 1st Edition. Stay tuned!